Hello! Today I have my attempt at a all white card/challenge! I feel like it's missing something but couldn't decide what so left it be. I just used a Darice embossing folder and added 2 different large snowflake dies that I had. 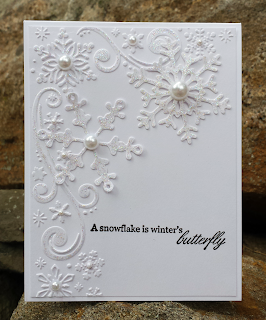 I covered the snowflakes with stickles and added some pearls. The sentiment is from an older Gina K set. Thanks for looking and challenges I'm entering are listed below. Be sure to stop back by tomorrow for the new Tuesday Morning Sketch. Oh Janice this is just gorgeous!! 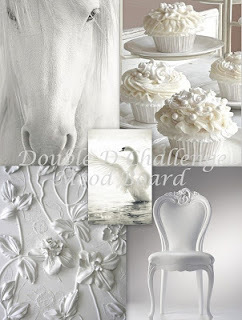 Thanks so much for joining in the fun at our Double D ‘WHITE on WHITE’ challenge! We hope you’ll come back often. This is so so pretty and if I made this, I'd probably not want to send it, but keep it for myself instead! LOL I love the addition of the 2 larger snowflakes and especially those pretty pearls! It's a beaut!! Your snowflakes are DIE-lightful, your sentiment precious and design so elegant, love it all! Oooh, Janice, this is so pretty! It doesn't look to me like it's missing a thing, but I felt the same way about my card. Yours, however, has all those gorgeous snowy snowflakes and the black sentiment is just enough contrast. I'm happy you shared with us at Double D! Your card is gorgeous. That is a wonderful sentiment. Simply stunning!! Love this! Thanks for sharing with us at Winter Wonderland.